According to the United States Defense Department, zapping your brain with electricity can turn novices into experts – of anything.The application of current to the brain – known as transcranial Direct Current Stimulation (tDCS) – received funding from DARPA, the US Defense Department, and more. And you can build your own with about $10 in parts, simple tools and some soldering experience. tDCS applies a small current from a 9v battery to the brain. This stimulation proved to enhance human cognitive powers (have a listen to NYC Radiolab episode entitled “9 Volt Nirvana” if you’re skeptical). Applying this current to different parts of the brain can give its users temporary (and sometimes permanent) cognitive enhancement. Research indicates that tDCS also works on depression, anxiety, and as a meditation aid. The most famous portion of the brain – the so-called F3 region – offers up to 40% improvement in specific categories of learning. Unfortunately, the long-term effects on neuroplasticity, brain function and more, remain unknown. The path to cerebral augmentation remains fraught with dangers – born from either your capacity for error and from the unknown long-term effects of artificial neural stimulation. Use this guide at your own peril! I cannot emphasize enough that users exercise the highest degree of safety in constructing their own tDCS device. Please read the section on “Electrode Placement” at the bottom of this article. In the 60s, a US Navy Sailor experimented with a 9V battery – by accident, he pushed negative and positive electrodes through the surface of his skin, and hooked it up to a 9V battery. As it turned out, blood (which contains iron) offers very little electrical resistance. As biological creatures, our bodies conduct electricity like a circuit. Many of our internal organs receive electrical current from our brains. A direct current can disrupt this signal, causing heart-failure. Furthermore, we know nothing about the long-term effects of tDCS on human physiology. While the electrical current of a 9V battery isn’t much at all when applied to a tongue, internal application is deadly. The tDCS device we’re building in this guide, the Inthinkerator MK. I, is from Reddit /r/tdcs user Kulty. The open-source nature of Kulty’s design allows us to borrow and modify it. From my perspective – as an amateur hobbyist – the design looks good. It includes short protection and is safer than other commercial devices such as the Foc.us (our review of the Foc.us Foc.us tDCS Headset Review and Giveaway Foc.us tDCS Headset Review and Giveaway The $249 Foc.us device shoots an electrical current into the brain – boosting one's cognitive abilities. Read More ). With proper build technique, the risk of creating a short-circuit is very, very low. Keep in mind that the design comes without warranty and could potentially fry your brains – you were warned. The total cost for parts should come out to around $10-20, but you’ll also require some basic tools as with any electronics project. Test the circuit first on a breadboard to determine if the parts are working and the circuit is correct – you won’t need all the parts yet. Note that we’re using a 220 Ohm resistor as a test load to simulate skin contact. The exact holes where the parts plug into don’t matter too much – focus on completing the circuit. If you’re unsure about using a breadboard, be sure to read our beginner skills needed for electronic projects Beginner's Electronics: 10 Skills You Need to Know Beginner's Electronics: 10 Skills You Need to Know Many of us have never even touched a soldering iron - but making things can incredibly rewarding. Here's ten of the most basic DIY electronics skills to help you get started. Read More guide first. When finished, you can attach the battery connector to your 9v battery and plug it into the positive and negative rails, on the side of the breadboard. If everything works, you should see the LED light turn on. If it doesn’t work, reanalyze the circuit to make sure it’s correctly wired. You will need to drill six holes. I suggest drilling from inside of the case, rather than from the outside. Also, make sure your components actually fit before moving onto the next hole. Hole 1 & 2: Drill two holes at the top of the box. These need to accommodate the screws on the cathode and anode banana jack. Roughly 1/4 to 1/3 of an inch will do. Hole 3: Drill a large hole, approximately 1/2 of an inch in diameter, to place the LED light and its chrome housing. Hole 4: Drill another large hole, approximately ½ of an inch in diameter in the center of the box to accommodate the potentiometer. Hole 5 (not drilled in picture): Drill a small hole, about 5/16th of an inch in diameter, to accommodate the trim potentiometer’s adjustable dial. Hole 6: Drill a hole, about 1/16th of an inch in diameter, to fit the power switch. Both banana plugs go at the top of the project box. This step won’t require much effort. Just drill two holes at the top of the box, remove the nut on the plugs and insert. You will then use the lug-nut to tighten the device into place. The only exceptions are the NPN transistor and the trim potentiometer, which you will hot-glue into place. NPN transistor: Make sure to place this with the round portion facing up and that the three pins point toward the right. Trim potentiometer: You will want to place this with the brass dial poking through the hole in the case. When you place the trim potentiometer in the case, make sure that the brass dial is secured using a lugnut. The lugnut is screwed onto the brass dial, once its been pushed through the hole in the project box. Of the three pins on the potentiometer, you will solder insulated wires to two of them. Solder a medium length wire to the central pin. Then solder a short-length wire to the outside pin. Again, you will only use two pins. Solder the central pin to the 1k Ohm resistor. You’ll notice that in the picture below, I’ve already wired this to the Emitter pin on the NPN transistor. Then take the wire soldered to the central pin of the potentiometer and solder this to the outside pin on the trim potentiometer. You may need to bend some of these pins for easier access. Don’t bend the trim potentiometer’s pins too much. A little bend won’t harm it – over-bending will cause the pin to snap off. There are three kinds of pins on the NPN transistor: Collector, Emitter and Base. Each pin corresponds with a different soldered connection. You will want to make certain that the pins are correctly wired or otherwise the circuit won’t work. You also need to make sure that the flat side of the NPN transistor is facing down. Collector: Solder a medium length insulated wire. Base: Solder a short length wire. Emitter: Solder to the 1k Ohm resistor, from the central pin on the trim potentiometer. You will solder three wires to the toggle switch. Each one of the toggle switch’s pins are rectangular, with a hole in the middle. You can loop wires through the holes, which aids soldering. Before getting started with connections to the toggle switch, take a long-length wire, and join an end of it with a 680 Ohm resistor. As with almost all physical connections, you will solder these together. On the left (outside) pin, you will solder two parts. First, take the wire/resistor (depicted above) and solder this to the outside pin on the toggle switch. Second, solder a 3.3k resistor to the to the left (outside) pin. Soldering both at the same time is a lot easier than soldering each on individually. Then solder the red (positive) 9v battery connector to the central pin on the toggle switch. Remember to not connect the battery until you are completely finished. The LED has two pins. Most LEDs use a long pin to designate a positive connector. That means the short pin is negative. If you wire this improperly, the circuit’s design will prevent the LED from lighting, but the circuit will still conduct a current. The negative (short) pin connects to the pin on the side (not the central pin) on the potentiometer. Take the short wire from the outside pin on the potentiometer and solder it to the middle of the LED. At the top of the pin, solder the 9V battery connector’s negative (black) wire. On the positive pin, solder a connection to the NPN transistor’s Base pin (central pin). In the middle of the LED’s positive pin, solder the 3.3k resistor from the toggle switch. Take the resistor end of the resistor/wire, already soldered to the outside pin on the toggle switch, and tighten it into the anode banana plug. You can tighten this without soldering, by using a lugnut. Just place the resistor’s wire against the first lugnut and tighten the second lugnut until it makes snug contact with the first lugnut. Take the medium length insulated wire from the Collector pin on the NPN transistor and tighten it onto the cathode banana jack, using the same method outlined in the previous step. This phase requires a multimeter and a small jeweler’s Flathead screwdriver. Testing won’t take much time. You’ll notice that at the base of the electrode connector (where it plugs into the banana jacks), there are two holes. These can be used to test the electrical output of the device. The Inthinkerator’s maximum output is 2 milliamps. I suggest turning the potentiometer’s dial all the way up to the right (clockwise) and measuring the output. If it falls outside of the specified 2mA, you must use the trim. potentiometer to fine-tune the output. And there you have it! 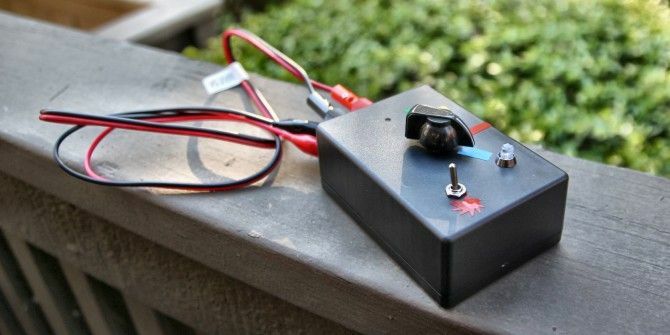 A completed tDCS device that cost around $10 to build. However, you won’t be able to use the Inthinkerator until you have suitable electrodes to attach it to your head. You can buy off-the-shelf electrodes or build your own. Keep in mind that saline-soaked sponges are the easiest to deploy, because they conduct through hair. However, if you would just like to experiment, gel-electrodes offer low-cost (and low reusability). One DIY solution I found comes from (again) Reddit user Kulty, using some sponge cloth and aluminium mesh. I won’t get into electrode placement, but one of the best websites for visualizing where the electrodes go is tDCSPlacements and Reddit/r/tDCS. I should also note that some “montages” or electrode placements can cause serious health concerns for those suffering from brain abnormalities. If you have a history of epilepsy DO NOT use tDCS of any kind. If you have brain implants, such as metal plates, similarly: DO NOT use tDCS. It can kill you. Additionally, some parts of your brain may function at a reduced rate — particularly regions near the anode. Let’s talk about tDCS in the comments – have you seen positive results? Has it made you feel anything unusual? Would you suggest a transient voltage suppressor to ensure safety? Where do we have to place the trim potentiometer , where will the brass part be ? I (sort of) made one of these in 20 minutes. It works, for sure! I used a strobe light controller and gel adhesive electrodes. Almost certain the voltage is too high considering, there's at least two 10k resistors an two 9v batteries connected to this thing. Yes, I know, "why would you not follow this instructable?" I made that thing, slapped it on my thigh and gave a single click. It felt like a single hair was being yanked from my leg. So I figured I should do a little more research. Where do I find a lug nut for the 500 ohm trim potentiometer? The trim pot didn't require a lug nut. It's been glued into place. I just realized there's a typo. Thanks for pointing that out. The Trim pot is glued into place. The Potentiometer uses a lugnut that came with it in the purchase link. Please read before you try this at home! I built my tDCS device exactly to these specs. Everything works well and its putting out 2mA but it is slowly climbing in output. I will turn it on at 2mA and thirty seconds later its at 2.20 mA, any suggestions? Sorry for the late response. Our notification system appears to have issues. Have you tried adjusting the trim pot to reduce the output? It's because as your skin is in contact with the wet electrodes the resistance gradually drops. This design is really not the best, because it relies on the user to continually monitor the current and adjust it. There are better circuits available on the internet. Search for one that uses the LM134/234/334 adjustable current source. It will automatically adjust the current to the set value, but not allow it to go over, and is no more complicated than this one. HI, thanks for the great writeup! My friend and I have completed the circuit to spec on a breadboard, but we're only getting a max of 1.17mA at output (with both pots all the way up). I did read your comment about the LEDs, but we're using a blue LED. Specs from the website are: "Each LED is rated for 3.1V 20mA, 465nm 4500mcd." That's a tough one. Perhaps one of the resistors is improperly positioned? Another possibility is that some of the connections are not making great contact. The voltage is actually higher on it. Hopefully the LED isn't what's causing the issue, but it's a definitely possibility. Hi there, does anyone have a link to some good quality insulated cables that are needed for this project? This is strange. I included a link to the wire in the article, but it appears to have gotten eaten. You can use 22 gauge insulated. Either solid or stranded works, but I prefer solid because it's easier to strip the insulation off and it's more durable when you strip it. That's the one. Thanks Michael! Sorry about the late reply. Apparently I'm not receiving proper notifications of comments. Amazon and eBay have some fantastic prices on wire. Thanks for letting me know Brady. I did something to mess that step up while editing it a while back. It should mention that there's a lugnut that needs to be tightened from the exterior of the project box. The lugnut fits over the top of the brass dial. Really nice article and well explained, but I'm curious as to why you have to go to all this trouble. What's wrong with just fixing some wire to the battery contacts and making some aluminium (kitchen foil) electrodes. (as you said skin resistance would be enough to keep the amperage low enough). Or am I being really silly to want to 'short-circuit' the complicated bits? That's a good question and I should have answered it in the article. My apologies! The potentiometer allows for granular control over the amount of power that's entering your body. When there are spikes, it causes something called visual artifacts, which oftentimes manifests as flashes of light. By manually adjusting the potentiometer, it reduces the amount of spikes that you experience, thus reducing artifacts. tDCS has been repeated enough times using technology similar to what's available in this article. Users who want results similar to what's available in clinical research will want to match their devices as closely as possible to what the scientists are using. Can you suggest a site to buy these parts individually or ideally in a package at a good cost (Amazon perhaps)? There's a link to the individual parts in the article itself. If it's blue, that means you can click on it. Note that when applying amperage with a device like this, that there are two measurements that are of concern. The first is amperage as output from the device, the second is amperage as input to the skin. This is also true with a TENS unit. Both values are important and bith should be limits. The value not discussed in an otherwise well done write up is the amperage per square unit surface area input to the skin. This should be limited to between about 25 microamps to 39 microamps according to several documents. This value for a TENS is much higher and one reason a TENS can't double as transcranial stimulator, either tDCS or tACS. So do yourselves a favor and calculate the size of your electrodes accordingly. Bbbbessssstt oooofff lllucck! In the list of material you have 2X 3.3 k ohms.Is that correct ? are they in parallel ? Sorry about that. There's an error in the diagram. One of the 3.3k resistors is used where it says a 240 ohm resistor in step one. It's supposed to simulate skin resistance. That should be the case. The banana jacks should correspond to red = positive, black = negative. The picture doesn't do a good job of showing this, but you can make some of this out if you look hard enough. Sorry about that! Yes i went the other way with the trim pot and it went down to low of 0.24mA. I'm using a green LED. Could that really be the cause? That is without question the cause. Unfortunately, different LEDs use different amounts of energy. The LED doesn't just light up, the energy it consumes (it's referred to as a voltage reference by the designer) plays an integral part in the amperage. Just swap it out for a white or blue LED. To be honest, I wish the design used either a red, green or amber LED. Blue and white are the worst colors to use. By the way, good job on getting everything else soldered in. This is a relatively complex project to solder together. Any troubleshooting tips? I'm getting a maximum of 1.22mA of current with both potentiometers maxed out. Everything else seems to be functioning just fine. 1.22mA is what you'd be getting if you turned the TRIM potentiometer in the wrong direction. Have you tried adjusting the TRIM pot in the other direction? Another issue is if the wrong LED light is used. If you're using a color other than white or blue, the max amperage will also fall somewhere around 1.2mA. With regard to my previous post referring to the DARPA project, I thought some of you may be interested in this post I made on another tDCS website – which has yet to receive comment! Is it just me, or has anyone else wondered why DARPA, an agency of the U.S. Department of Defence, would disclose precise details of its project to make dramatic improvements in sniper training by using relatively simple tDCS methods? Perhaps they want to play fair so that the Taliban can train their snipers to become crack shots too? Let’s just hope this is simply disinformation and we’re not just all considered acceptable collateral damage in a project to fry the brains of the enemy. If you think I’m an old cynic, perhaps some of you may remember the 1960’s Mohole Project? Mohole was a multimillion US government investment, supposedly, to ocean drill seven miles deep to the earth’s mantle to see what it is made of. The involvement of Howard Hughes and Bob Ballard as prime movers and shakers should have been the clue to us avid followers that all was not as it seemed. Many years later it was leaked that the Mohole Project had been part of Project Azorian, a CIA disinformation cover to draw attention away from the real use of Hughes’ Glomar Explorer to recover the sunken Soviet submarine K-129. Various other vessels supposedly developed for the Mohole project were actually part of an at sea floating workshop program to support the American nuclear submarine fleet. The CIA must have laughed like drains when the Soviets ‘beat the Americans in the mantle race’ by drilling a totally useless 7.5 mile deep hole on the Kola Peninsular, North East of Finland. Any of you guys want to see what the mantle is made of just come and visit us on the Lizard Peninsular, Cornwall UK, one of only two places on earth where the mantle pierces the earth’s crust. Plateful of fried brains anyone? I'd like to respond more in depth to this post, but you bring up a valid concern. I won't make further comment, but an independent meta-study (you can Google for it) found that tDCS had no positive or negative effect on any cognitive function -- except for perhaps reflexes, in which case it had a positive effect. Anyway, great comment. Thank you. It's always a good idea to treat this sort of thing with healthy skepticism. Thanks very much for your kind reply to my post. You are quite right to warn about the dangers of applying ANY voltage and current to a wound, broken skin or even acne. The combination of haemoglobin and salts etc. typically has resistively of around only 150 ohm/centimetre, which would dangerously increase the current to levels that could easily challenge the central nervous system. Part of my career has been spent on the design side of high voltage power engineering and has left me with a healthy respect for all electrical shock – it’s well known that even low voltages can be risky in the wrong circumstances. Nevertheless, apart from doing something stupid, the current levels we are talking about are well under the 2mA guidelines. Whether even 2mA is a good idea is another question though. From what I read there is some concern, amongst some neuroscientists, that as the anode appears to excite neurons on that side of the brain in a beneficial way, then what if the cathode causes depletion effects on the neurons on the other side? It appears that some experimenters are addressing that potential problem by spreading several cathodes in parallel, placed over a wider area, presumably to reduce the cathode current at any particular point. DARPA appear to have moved the cathode to the upper arm, possibly for the same reasons. Whilst on that subject, I personally have some scepticism over the DARPA program anyway but will not muddy this post with them – perhaps in a separate post. As to my own design, the LM334 is simple enough to use so it will be some minor variation on the circuit in the link below – unlike many addled lash-ups, this one follows the manufacturer’s design notes, covers most of the bases and appears well considered. I’ll be starting out with a single PP3 battery at 9volts and, if I feel comfortable, move on to two PP3 in series to give 18volts as in some of the professional units – obviously the resistor values will need a little tweaking if the battery voltages are changed but the inclusion of a mA meter will make that very easy to do by trial and error. I doubt a fuse will be included though - enough already! I’ve built various ‘mind tools’ in the past but haven’t built and tried this one yet. I’m an industrial electrical engineer, with plenty of extra electronics experience that goes back more decades than I care to remember. I’ve spent a fair time investigating tDCS on the net, particularly YouTube, and there appears to be much woolly thinking in the electronics theory – many of the experimenters clearly have no theory at all. Let me justify that wild statement. The professional experimenters generally advise a maximum of 9v DC at a maximum of 2ma current. Very sensible. Most of the amateur designs have taken this warning seriously, as they should, and have rigged up various current limiting arrangements (often using a LM334Z ic). Sound sensible as a measure to ensure you don’t fry your brains? Well it is, but I can’t see how a PP3 battery will do that anyway. Anyone heard of ohms law? I=E/R (Amps = Volts/Resistance). Using a good quality digital meter, I’ve just measured the DC resistance from above my right eye to the side of my left temple: Dry, it was just under 1M ohm (1000,000 ohms). Using saline saturation on both electrode pads it was just over 100K ohm (100,000 ohms). Using Ohms law, let’s make the calculation easier by upping the voltage to 10v, which would actually increase the current flowing through you brain! 10v/100,000 ohms = 0.0001A, which is just 0.1ma – i.e. 1/20 of the maximum current recommendation. To exceed the safe maximum of 2ma current your skin resistance would have to fall below 5000 ohms and I’ve found no electrode spacing on my head that gets anywhere near that low. Sure, I’ll be including a current limiter of some sort when I do my build – at my age I’ve got enough dead brain cells as it is – but I do think we need to tighten the equipment design thinking up a little. I’m personally much more concerned to find out about the potential for irreparable brain damage even when using tDCS within the scientific guidelines and currents. Hi Chris, thanks for the wonderful comment. I'd love to see your tDCS build when completed. Do you have a social media account that I can follow? Regarding Ohms Law, the warnings are mainly intended to address those with open wounds on their heads or arms. I know that sounds silly (and it is silly), but it's because of Ohm's Law that a 9V battery can kill. Basically, because blood is conductive (apparently because of the high iron content of hemoglobin) any electrical current applied internally can disrupt the heart. Blood is low resistance. Also, anyone with a brain abnormality can suffer a seizure. But overall, my experience in these matters is not great. I did consult with a neuroscientist regarding tDCS and his opinion was not positive. The potential for long-term damage, even a small chance, is not encouraging. Even so, I still use tDCS on a daily basis, at spaced intervals. It seems relatively innocuous. So far at least. Not so much an element to tune the amount of current. Just a timer that shuts it off after a certain period. Like 13 minutes. So someone doesn't overdo it accidentally. This is, simultaneously, the craziest, most interesting, and possibly coolest DIY I've seen on here. I'd be a little scared to use it on myself without extensive training, but I can see how it might benefit a person. If duration of the treatment is critical, and it sounds like it is, maybe put a momentary switch or timer on the power? Maybe a potentiometer to regulate the amperage? Not criticising, just brainstorming. No pun intended. Thanks for the comment Guy! That's actually a great idea, but I don't know of any component that can regulate current using a timer. The next obvious step is using an Arduino as a controller for more complex functions. Right now the time duration for optimal long-term changes is two 13 minute treatments with a short break between each. Hilarious pun, by the way. If you think this is a good idea, you might need it. Nice tinkering. But the warning about possible dangers is much too brief and vague. I surely would have liked to see some more specific warnings here about the actual use of the finished product. (1) Expert doctors never use tDCS for longer than twenty minutes -- you shouldn't, either. (2) The maximum current of this DIY gadget is 2 mA but normally it's much safer to try 1.0 or 1.5 mA first and if it seems to work, keep it at that. (3) Never use a thing like this if you have serious physical problems, especially not if you're prone to epileptic seizures. (4) Make sure that (a) you know the exact right spots to place the electrodes and (b) you don't inverse the positive and the negative. Research is very clear about this: getting the position or the polarity wrong can actually impair brain functions instead of improving them. Thank you (I believe that I have read your writing at one time or another on another website) for the informative comment. I made some minor corrections and will -- when time permits -- edit in a clearer warning to potential users. I have read about experiments which exceeded the 13 + 13 minute mark -- some have used quite long time periods, although I cannot remember the exact amperage. It was likely lower than 2. I think it was found that the most effective time frames were around 20 minutes, total, daily.